There are clinical studies that home-based respiratory muscle training (RMT) appears to be an effective strategy for increasing respiratory muscle strength in children and adolescents with Chronic Lung Disease (CLD) or Neuromuscular Dystrophy (NMD), although it increased the ability to cough effectively only in those with NMD*. It this study you will find the statement: Low motivation and engagement are barriers in physical therapy exercises. I totally agree with this statement. I work as respiratory therapist at Rijndam rehabilitation. I give therapy to children and young adults. For the sake of increasing engagement and therapy compliance with youngsters I started to use electronic musical wind instruments during my therapy sessions (year 1999). In 2008 I founded My Breath My Music foundation and co-developed a new wind instrument (the Magic Flute). For me developing the GroovTube and Breath Controlled apps was the next logical step. I use the GroovTube now in most of my therapy sessions and most clients use the device also at home. The great thing about the GroovTube is that you can start with very young children (2 years old). From a very young age the children are accustomed to the fact that they practise their breathing. We don‘t overdo it but the little ones are already developing a very good breathing technique. Another side effect it is the effect of lip strengthening. *** Certainly for some muscle diseases such as duchenne and myotonic dystrophy. The GroovTube is a high–quality product. You can adjust it very accurately. This allows children with a very limited lung capacity to do their exercises. You can practise both inspiratory and expiratory. You will not find this in any other system on the market. A workbook has been specially developed for practising at home. 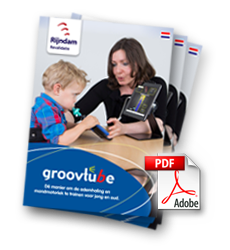 The GroovTube is used during inspiratory and expiratory muscle training and oral motor training during physiotherapy, speech therapy and respiratory therapy.